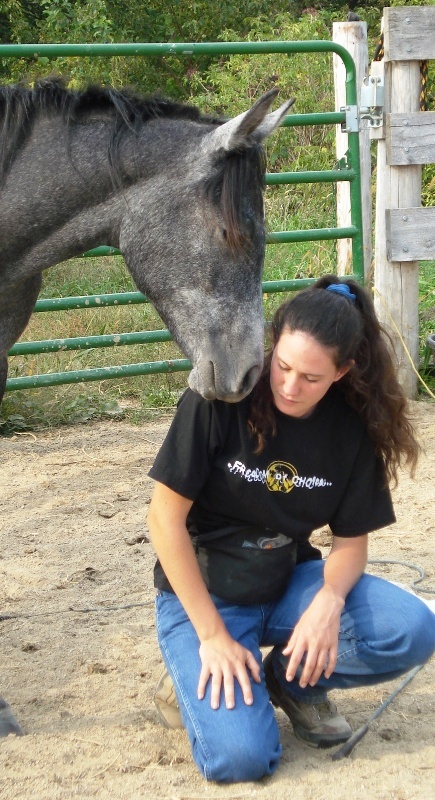 When I work with horses, I tend to be too goal oriented, or, to put it another way, I am too focused on what is supposed to happen and I often miss opportunities that are right in front of me. To highlight how I have begun to change, here is a couple of stories about this mare I just started training. Today was the second session of working with her. I worked on endotapping her both the first and second session. Normally, I would begin endotapping and be very focused on them dropping their head first and then on signs of relaxation. However, with this mare, I am learning to look at the bigger picture. She usually doesn’t drop her head (it isn’t high to begin with), but if I watch she shows clear signs of relaxation. Today, I began to endotap her softly, keeping an eye out for any signs of relaxation. (I also try to be careful not to intently focus on her.) She mostly just stood there, so I kept endotapping her softly. Then I saw her eye start to blink; I kept tapping her until I heard one of the other horses (on the other side of the fence) give a big sigh. Before, I would just have kept tapping until she gave a bigger sign of release, but this time I stopped tapping and I gave a big sigh and tried to relax. Then the mare gave a big sigh, stretched out her neck, and nearly yawned. This is the biggest sign of relaxation I have gotten from her. I praised her for that. Also, I have been doing jaw flexions with her with a snaffle bit. I have been asking her to give her nose, but I have also been releasing when I thought she was going to relax, even if she did not give her nose. This seemed to help her pick up the jaw flexions very quickly and calmly. As I have been reflecting on these things, I realize again how much horse training depends on feel. I need to constantly make sure I am where the horse is and not just checking things off my list. I am learning to watch the horse and go from there and not necessarily have a to-do list every time I work with a horse. So here I am, just an ordinary person, learning to feel from the horses. « Remember to keep on Dreaming!